Alice Thompson, soil expert out of Berkeley University, 1906. Girl from Honolulu Becomes Expert. “BERKELEY, Jan. 12.—The dainty figure of a feminine soil expert, working with the bearded men in the agricultural college on the campus is new in the history of the university; this will be seen when Miss Alice Thompson takes her place as an assistant soil analyst in the office of Dr. Loughridge’s office on January 15. The hand wields the scepter. PRINTED BY BOYS OF KAMEHAMEHA SCHOOL. HONOLULU, H. I., JANUARY , 1889. As a convenient medium of communication with the friends and patrons of Kamehameha School, it is believed that Handicraft will receive a cordial welcome. It will be our aim to foster the interest of the public in our school, and to keep prominent the subject of manual training. We shall make this emphatically a Kamehameha journal. While taking note of all educational matters in our little Kingdom, we shall specially aim to serve the interests of this school, and to promote its growth and development. Handicraft, Volume I, Number 1, Page 2. January 1889. More on ’93 KS graduate, Abraham Pihi, 1898. MY DEAR SWEETHEART HAS JUST PASSED, AND MY EMOTIONAL SUPPORT HAS BEEN TAKEN AWAY. Should it be satisfactory to you and your workers, here is my bundle of olive leaves that is placed above, so that our many loved ones living all the way from Haehae where the sun rises to the pleasant base of Lehua where the sun sets may see it. My beloved has gone, my companion who I would talk with in days gone by, that is my beloved man, Mr. Aprahama Pihi, who is a native and a familiar one of the land famous for the “Kanilehua” [Hilo] and the fragrant bowers of hala of Puna, and the land of the Haao Rains [Kaʻū], that is the roots of my dear husband who left me, his companion, his wife, grieving at the side of his grave. Auwe! How dreadful. 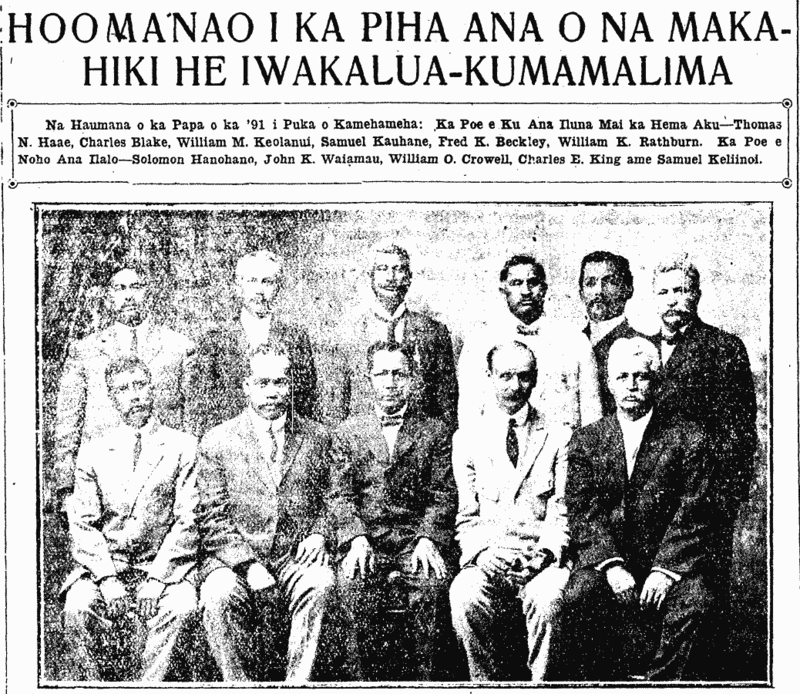 Abraham Pihi was born in Puueo, Hilo, Hawaii on the 5th of January, 1872, of E. P. Hoaai (m) and Lilia Palapala (f), and the two of them had 7 children: 5 daughters and 2 sons; and 2 of them went off in search of the footprints of their parents, and 5 remain mourning on this side: 4 girls and one boy.